Find our cheapest flights to Taipei from Auckland. Taipei is hard to describe with just one word, although 'wondrous' is getting close. This mesmerising city, the gateway to Taiwan, is a one-of-a-kind Asian experience that embraces fun, food, culture and nature. Air New Zealand flies non-stop between Auckland and Taipei between three and five times per week. For travel-loving New Zealanders, this is a chance to explore a captivating destination that's known for urban sophistication, cultural attractions and breathtaking natural scenery. With its unique blend of Asian ethnicities, Taipei is both beautiful and fascinating. Non-stop flights from Auckland to Taipei take around 11 hours and depart year-round three to five times a week. As well as Economy (with optional Skycouch™) and Premium Economy seats, you have the option of Business Premier™. If you're interested in our cheapest flights to Taipei, we run regular special promotions. You can sign up for alerts to receive advance notice of cheap flights. 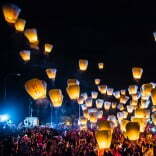 The extraordinary history of Taiwan has made the city of Taipei a magnificent mix of Asian cultures, with a sprinkling of expat society as a finishing touch. Fill your days with exploring, fun and shopping, then feast on local street food delicacies at the night markets. Old and new, intriguing and wonderful, amusing and complicated - Taipei is totally captivating. An easy way to get familiar with Taipei and its main attractions is with a hop on hop off bus tour. These distinctive red double-decker buses loop around the city, allowing you to easily explore all the main points of interest. The public transport in Taipei is legendary - too good to ignore. Buy an Easy Card and you'll get discounted metro and bus rides, as well as free 30-minute rides on YouBike public bicycles. If you'd prefer transport with the personal touch, there's a huge range of guided tours in Taipei. Eating out is so embedded into Taipei culture that some city apartments don't even have a kitchen. The casual restaurants and street food markets offer fantastic value for money - they're cheap, cheerful and the choice of dishes is vast. At the other end of the scale, there's a growing collection of Taipei Michelin star fine dining restaurants that serve up an exceptional Asian-fusion cuisine experience. Discover the classic flavours of Taipei, such as stinky tofu and blood cake, as well as some you didn't know existed, like deep fried milk and da chang bao xiao chang (small sausage wrapped in a big sausage). For a local's perspective of the cuisine scene, consider a Taipei Eats tour. It's an off-the-beaten-path progressive dinner of night market street food, complete with a guide who speaks English. You'll discover the classic flavours of Taipei, such as stinky tofu and blood cake, as well as some you didn't know existed, like deep fried milk and da chang bao xiao chang (small sausage wrapped in a big sausage). Coffee has been a part of Taipei culture since Fong Da coffee house opened in 1956. Fong Da is still going strong, using vintage equipment to create modern caffeine fixes - even cold-drip coffee. The most Insta-friendly café of all has to be Oia, the alpaca café. Here several house-trained alpacas keep the coffee drinkers fuzzily entertained. 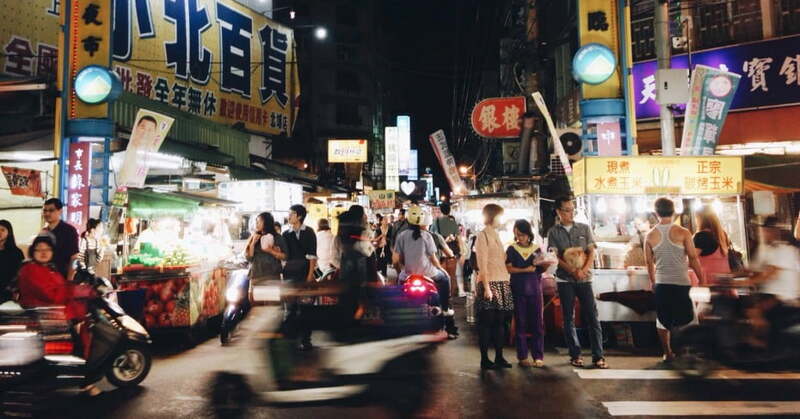 Like daytime Taipei, after dark Taipei is surprising, complex and diverse - but even more so. The city has a considerable population of expats who like to unwind with light shows and tech-house dance music - Carnegies and On Tap are two places that thrive on expat attention. There are also quirky themed venues, like Rilakkuma Café (dedicated to an adorable stuffed bear) and Modern Toilet (where the seats are toilets), as well as classic speakeasy-styled bars that pour creativity into their drinks. For live music, EZ5 hosts some great local acts and the ticket price includes food and drinks. When you want Taipei nightlife with a massive city view, there's a choice of rooftop bars. There's WET Bar on top of the luxurious W Hotel, Quube on the fifth floor of Le Meridien and Kloud on the 10th floor of the ATT4Fun shopping centre. The biggest view of all can be found up the bamboo-inspired 101 building. Taiwan's human history can be traced back to the prehistoric Stone Age, when Austronesian people lived on the island. Interestingly, there is proven lineage running from Taiwan's inhabitants of 5000 years ago to modern-day Polynesians, including Māori. Today around 2% of Taiwan's population are direct descendants of the original Taiwanese. Throughout the city, magnificent historic buildings and landmarks are carefully maintained to ensure the past remains part of the present. You can visit temples, bridges, public parks, museums, memorials, forts and old hotels. If you take a tour, a local guide will retell the stories associated with every location. A big plus for a holiday in Taipei is the close proximity of wilderness and park areas. North of the city is the Yangmingshan National Park, which has cycling routes, hiking trails and a really impressive volcano - Qixing Mountain. The gold mining village of Jiufen in the Northeast Coast National Scenic Area is another significant Taiwan attraction. In particular, Jiufen Old Street is an amazing place for a glimpse of the past. The train journey from Taipei to Taroko National Park is a fantastic way to see rural Taiwan, the coast and some extraordinary mountain scenery. The highlight of Taroko is the gorge - a whopping 19km canyon that's considered by many to be the most extraordinary landscape feature in Taiwan. Further south is Kenting National Park, famous for its beautiful beaches, snorkelling and limestone caves. Taipei is in a sub-tropical region, so temperatures are mostly comfortable. Many people choose to visit during the driest months - October, November, December and January. March to May is a great time to visit if you prefer moderate temperatures and don't mind some rainy days. Summer - June to August - is the official off-peak time, which means you'll be able to score some excellent accommodation deals. While it has a first-world economy, prices for accommodation, meals and activities in Taipei are fantastically affordable. You'll find your travel dollar goes a long way. After paying for accommodation, we recommend you allow NZD $100 per person each day for food and fun. In addition to routine vaccinations, the following vaccines are recommended for Taiwan: typhoid, hepatitis A, hepatitis B and tuberculosis. If you're a New Zealand passport holder, you won't require a visa to enter Taiwan for stays of up to 90 days. Your passport must be valid for a minimum of six months from your arrival date. If you are not a New Zealand passport holder, we recommend you check relevant entry requirements before you purchase fares with Air New Zealand.